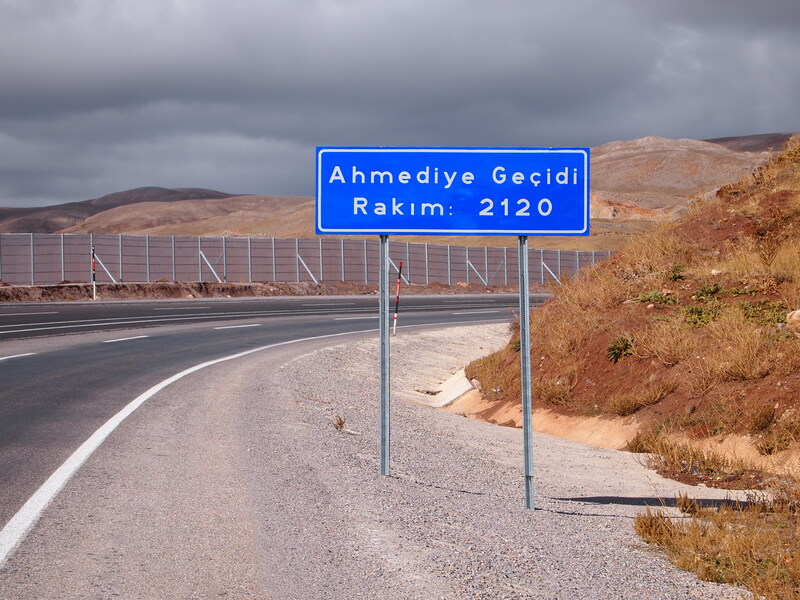 After Goreme I headed off for Kayseri, the nearest city. 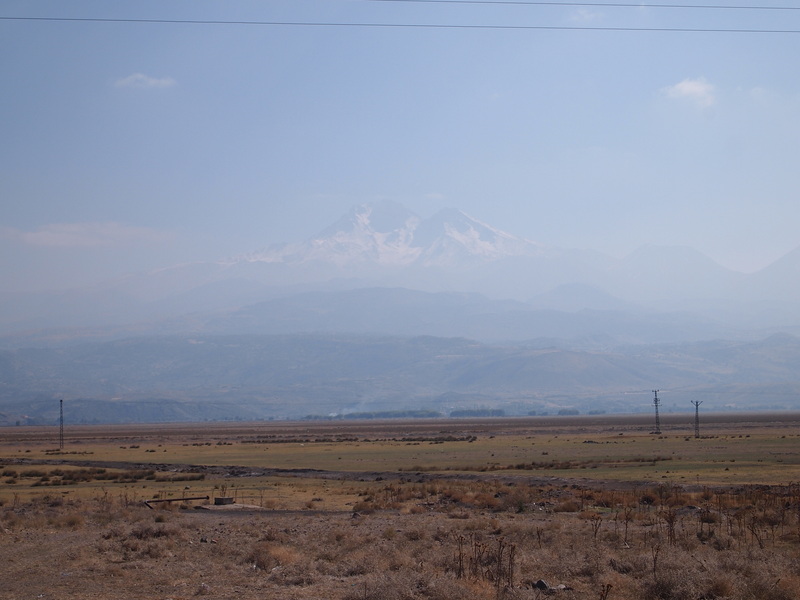 As I rode towards Kayseri the mountain Erciyes loomed closer. sadly the day wasn’t that clear so I didn’t get a great photo. 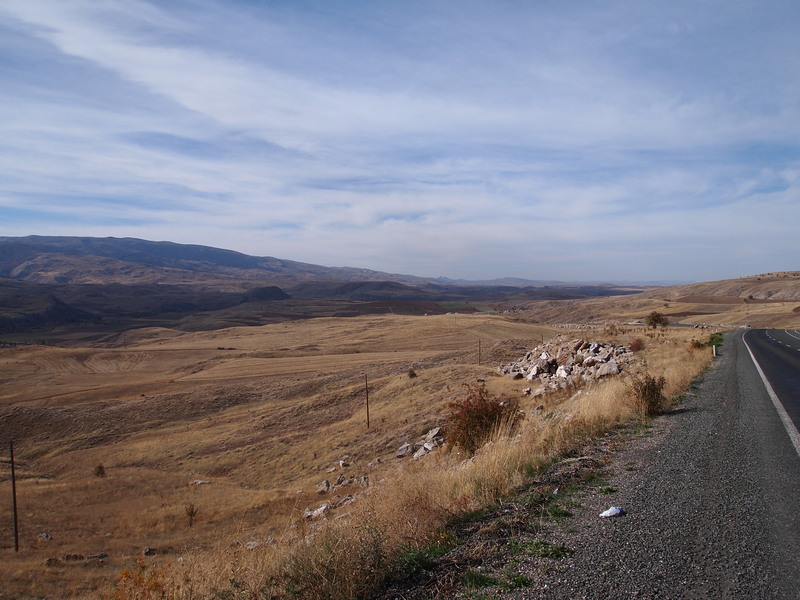 The road to Kayseri was fairly uneventful, I left the wonders of Cappadocia behind quite quickly. After that there was only Erciyes to marvel at in the distance. 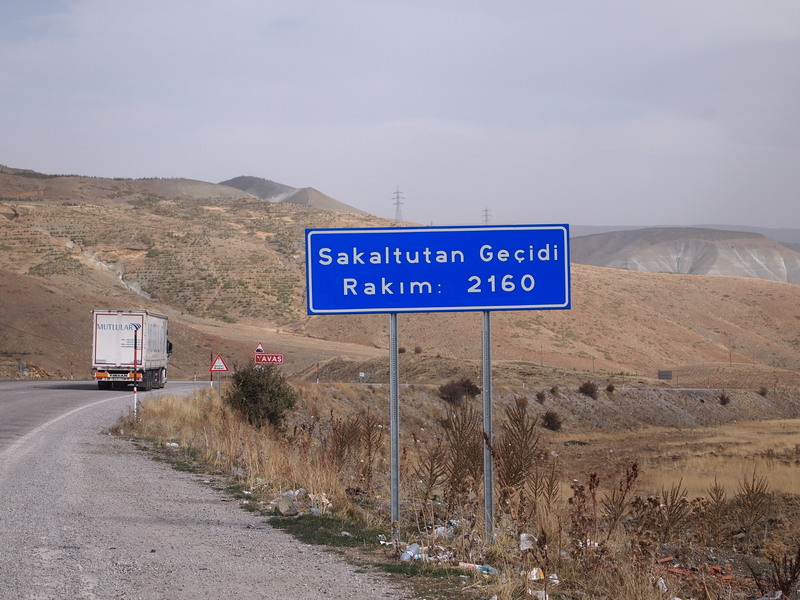 Reaching Kayseri, it turned out the city was much larger than I had expected, having a population of around 1 million. There was thus quite a lot going on and I was glad I had arrived early giving me a chance to look around. 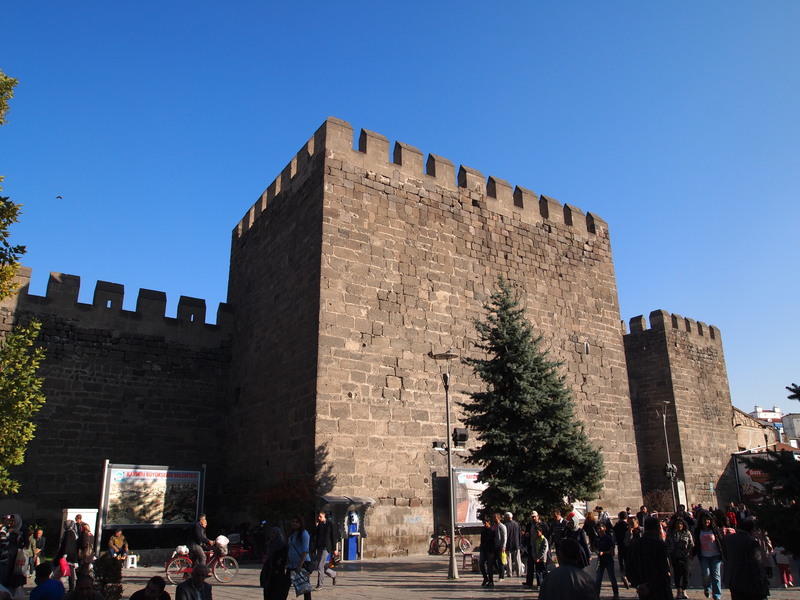 The city was noted for its Seljuk architecture which was blocky but effective looking. It also had a caravanserai that a random man with good English started showing me round. I thought this was very nice until we arrived in his carpet shop, where after explaining about the carpets he tried to sell me one. I made it clear I didn’t have room on my bike and he made it clear he could send them by airmail. So I had to resort to the ‘no home anymore’ gambit allowing me to escape rug free but knowledge rich. While in Kayseri I also tried the renowned Kayseri manti, which is basically Turkish ravioli. 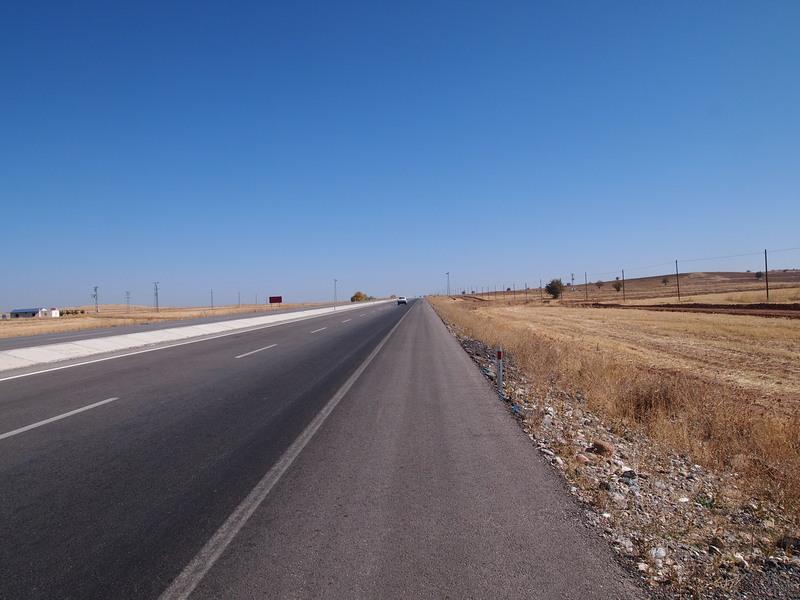 After Kayseri I set off towards Erzincan and four days of hard riding. 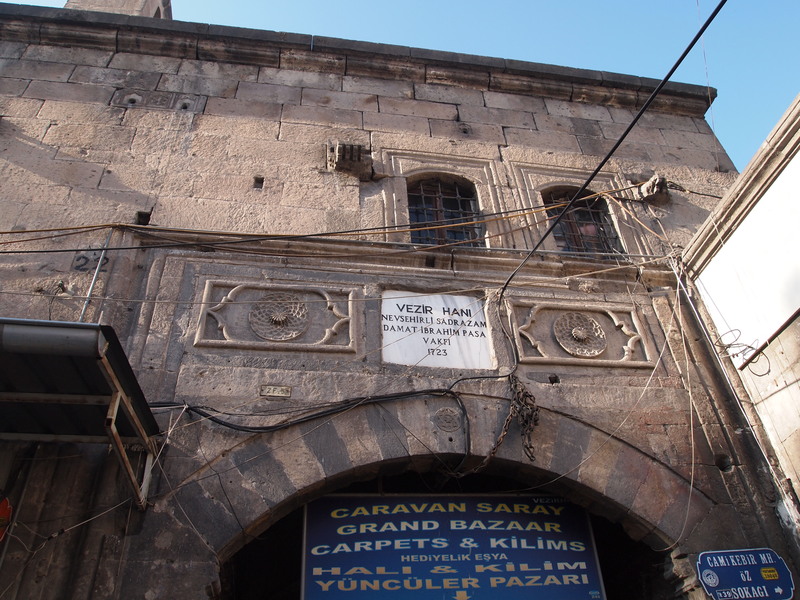 During this period it was Kurban Bayram, a muslim festival to honour Abraham’s willingness to sacrifice his sons. What this boiled down to for me was that throughout one day I saw a lot of people in the fields near their homes butchering cows. Apparently sacrificing animals is a big part of the festival and this was the main part I saw as I rode along. Mainly though I saw road. At one point I was pulled over by some people living in a tent encampment. They’d seemed insistently friendly as they’d shouted and gestured to me from the roadside and it was about time I stepped off my bike for a rest so off I went. I quite quickly wondered if this was a mistake as about ten people started clustering round me looking at my bike and pulling at things and I hoped no one would make off with something. Thankfully an older chap brought some order and they offered me tea. I thought this would take about ten minutes and then I could be off. They brought me over to a rug thing on the grass and sat me down and more people came over and said hello. The group’s children all came and sat round me and started laughing and poking me, which was all very nice. 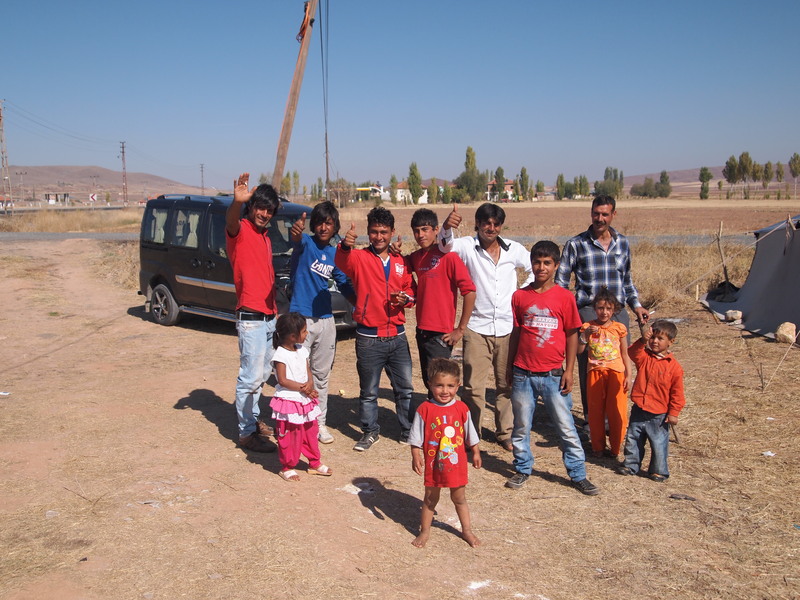 I wasn’t 100% sure what these people were, whether they were Turkish gypsies or just people who lived in tents, they were certainly pleased to see me. The tea seemed to be taking a while though and then I noticed that they had to wash up all the glasses first, then they needed to heat the water on the fire and basically go through the whole process of tea making from the start with no running water and using a campfire. Forty five minutes later I got the tea…it tasted OK. The children had remained fascinated with me while we waited and it had struck me how strange I must look to them in my cycle gear with blue eyes and fair hair. I think they tried to invite me to lunch but having seen the guy cutting the meat up next to me I thought it better to just pretend I didn’t understand (I didn’t really anyway) and ride off and avoid food poisoning. After that there was more road. 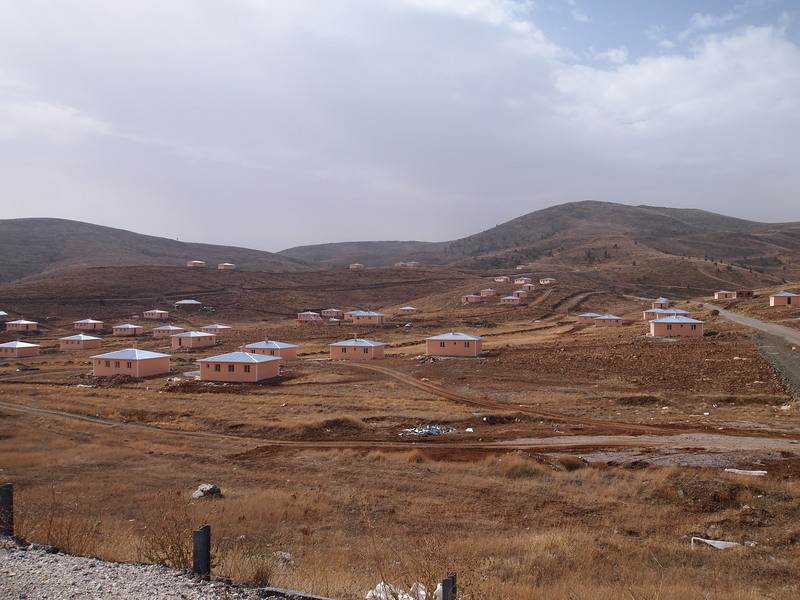 With the occassional settlement nestling against the hills/mountains. 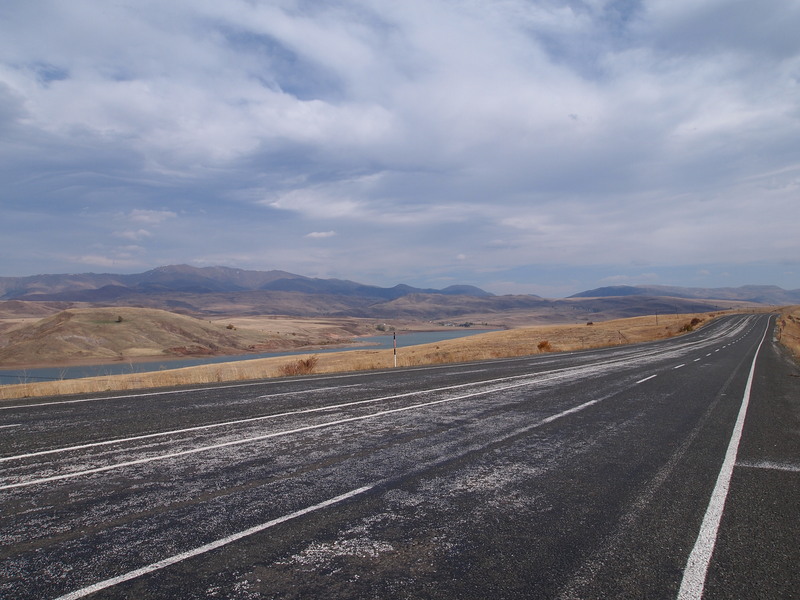 For this portion I had decided I would try and only camp, so I spent three consecutive nights at petrol stations. All of which were better than previous ones, having nice grass to pitch on and restaurants to sit in. 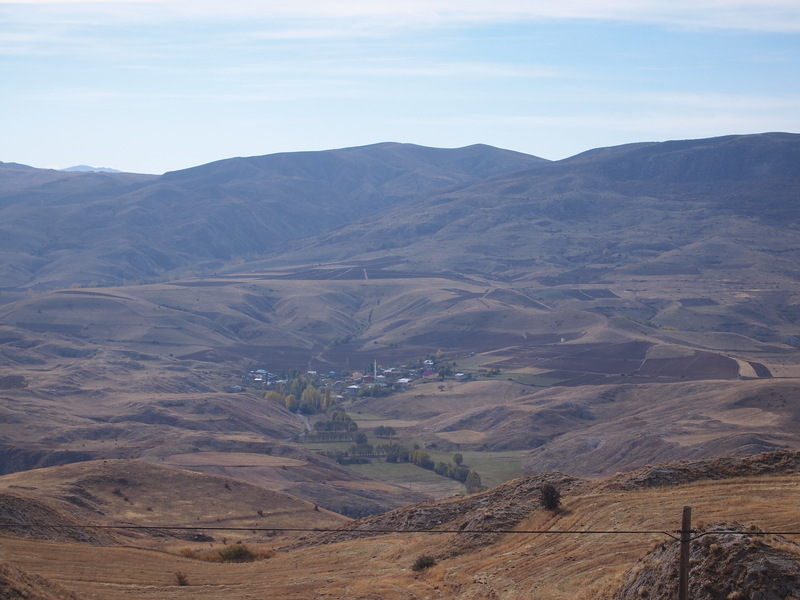 On the third day out of Kayseri I stopped at the town of Imranli for some supplies. Here people were incredibly kind – buying me tea, giving me fruit and sharing their lunch. 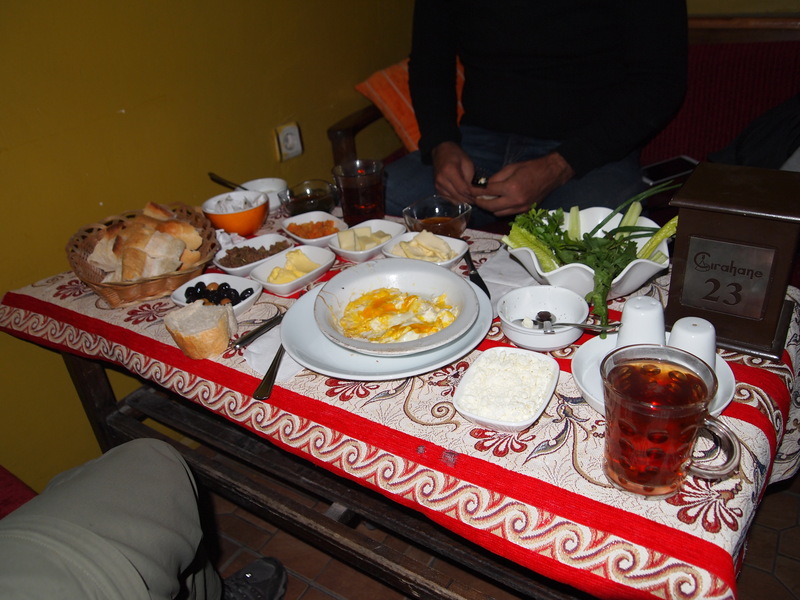 It was more examples of the incredible Turkish hospitality I was being shown. Sadly after Imranli I also started to run into some incredible Turkish wind. The going was getting tougher. You can’t see it because it is invisible but it was very windy when I took that photo. After Imranli I also hit an unexpected peak. I knew I would have to climb a few mountains on the route I had chosen but I had expected them all to be after my next planned rest day. I was thus a bit surprised to find myself at over 2000m being battered by high winds. 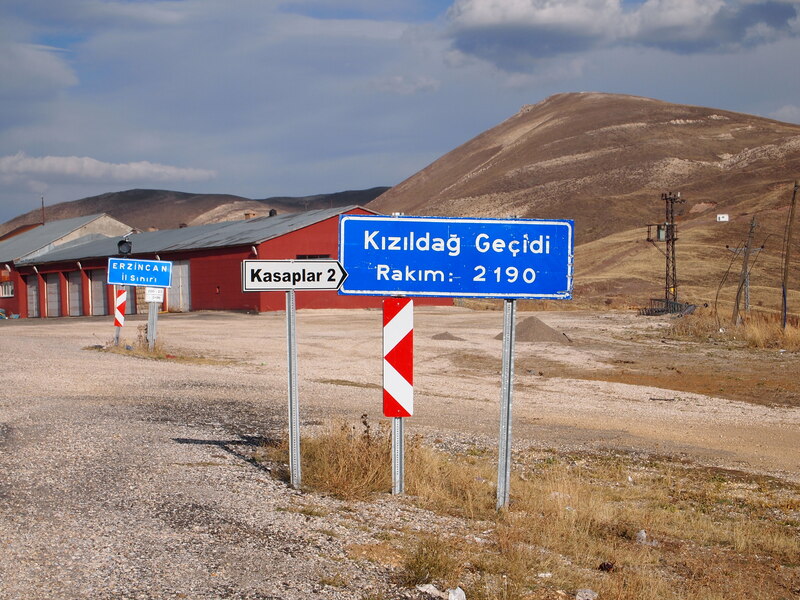 I also accidentally took a photo of a Turkish military site at the top. I normally avoid photographing people with guns as sometimes they don’t like it. I only noticed the sandbags and the soldiers after I took this photo. After this peak there was a depressingly long descent, depressing as I knew I would have to climb back up to the same height I’d descended from again later. 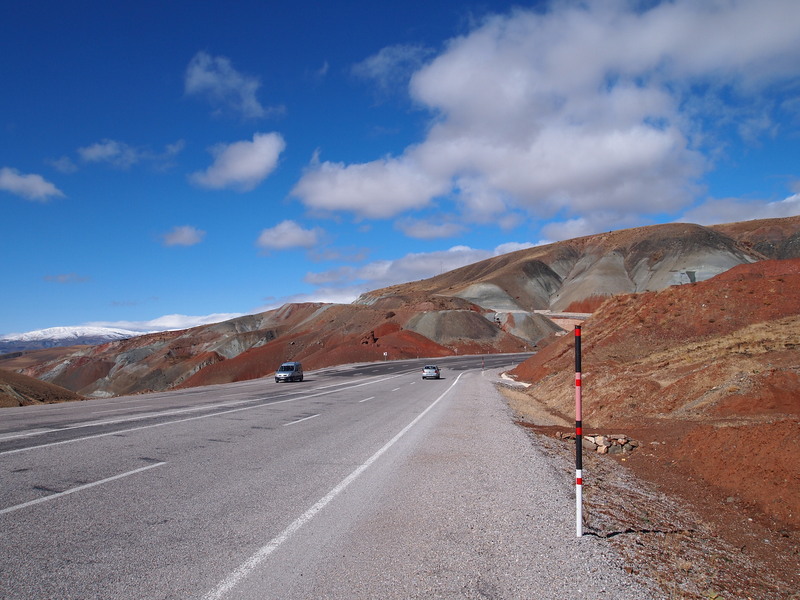 I’d thought the wind on the previous day had been bad but nothing had prepared me for the final days ride into Erzincan. Sometimes the wind was so strong it literally blew me to a stop, this was on top of the fact that the first part of the day was spent climbing; normally it is bad enough going up a mountain on a touring bike but with the wind as well it becomes pretty unpleasant! Also the weather had changed, I’d been riding under clear blue skies for about two weeks. Now dusty clouds had closed in and it looked like nuclear winter had set in. Finally I reached the top of the day’s mountain. Where they had randomly built some weird buildings. People will apparently live anywhere. I thought I was going to be in for a nice easy descent but apart from the very first kilometre or two off the top it was almost as hard as going up. The wind was so strong I was worried I was going to be pushed back up the mountain at some points! I haven’t got many pictures of this bleak wind battered section of the ride as stopping was not something I was interested in doing. It turns out I was not the only one who had had trouble with this section. 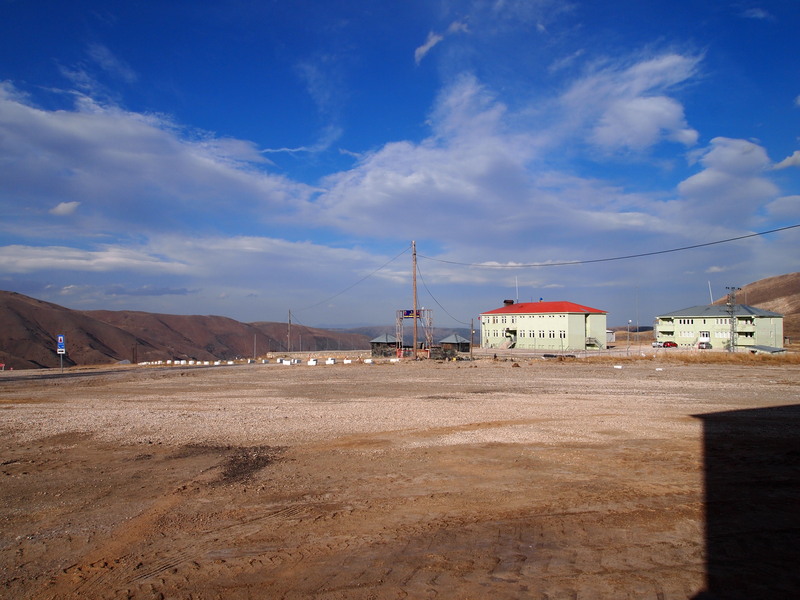 Eventually though I reached Erzincan and found myself a cheap hotel. As I was spending a rest day there I looked on couchsurfing to see if there was anyone who could show me around. I hadn’t had the internet for the period before so I hadn’t been able to search for anyone to host me. Looking through I saw a guy with a bike in his profile picture and thought well we have that in common and sent him a message. This it turned out was a good idea and shortly after Zafer picked me up and took me for a Turkish dinner at his friend Cengiz’s restaurant. I’m not sure what the dish was called but it was delicious. After dinner Zafer first took me to hospital, not because I needed to go but because he was an on call cardiologist there and had to do some work quickly, after that he took me to a hammam. This was different from the ones I had been to previously as it was a newly built one. This was actually a lot nicer – there were a lot less guys with huge bellies and moustaches working there. The next day he picked me up from my hotel and took me for a massive Turkish brunch. And then up into the mountains round Erzincan to see some waterfalls. 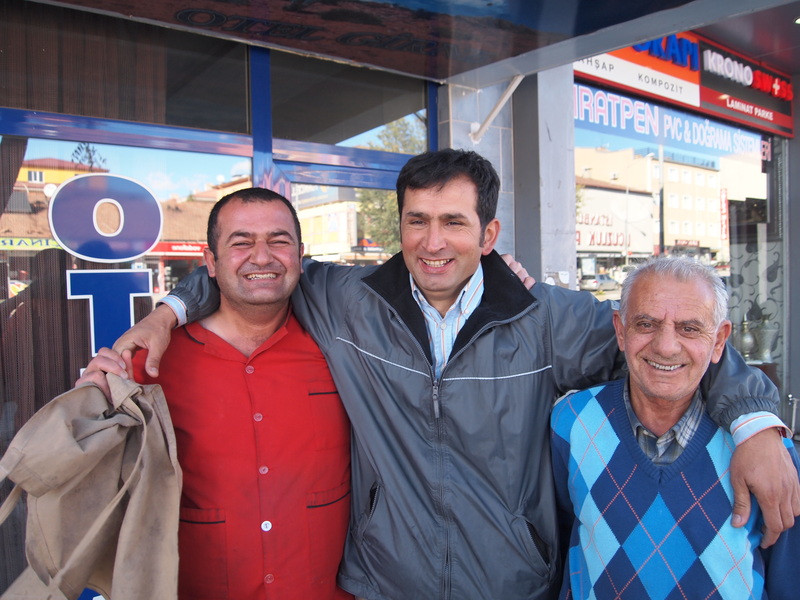 Zafer really made me feel welcome in Erzincan and it seemed like he knew everybody there. The next day I was sad to be leaving, especially as I knew I had even more tough climbing to deal with. First off I had to get my bike out of the cellar under the restaurant adjoining the hotel I was in. Luckily they had a big guy working there to help me lift it out…not the one on the right. Sadly I’d noticed someone had stolen my bicycle pump, which was attached to the frame. This was quite disconcerting as I had met only with kindness throughout the trip and to have someone take something made me remember that not everyone is nice. At least it was only a bicycle pump and it allowed me the fun of trying to find a replacement. 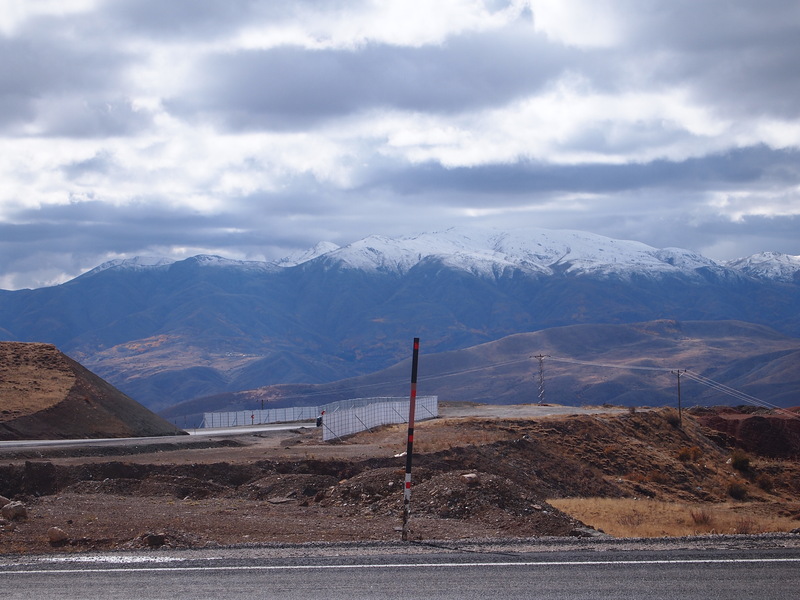 Leaving Erzincan I realised how beautiful the surroundings round it were – the weather had been bad the day I arrived and the day I stayed and it had only cleared up for when I was leaving. 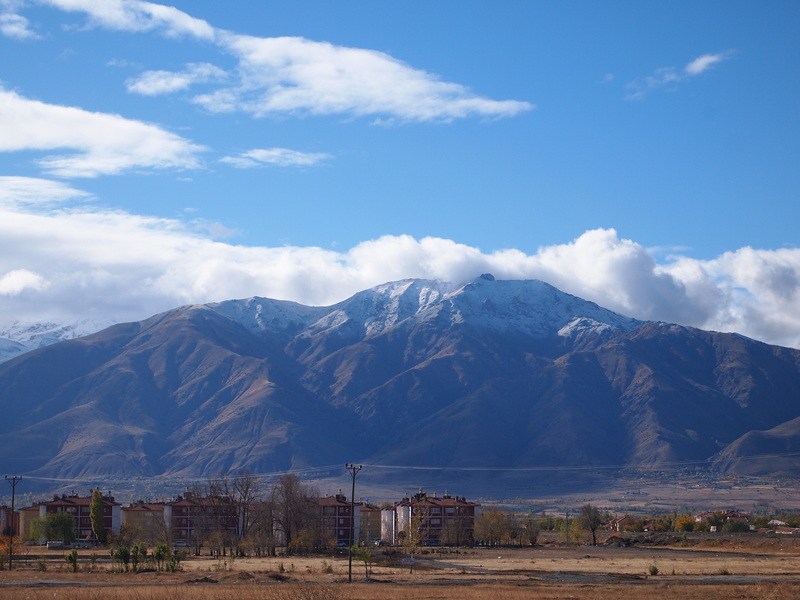 But wow, the city was surrounded by beautiful snow capped mountains. It looked really amazing, though the snow was slightly worrying. The first part of the day out of Erzincan was spent relentlessly climbing again to reach another peak. The view at the top was amazing.